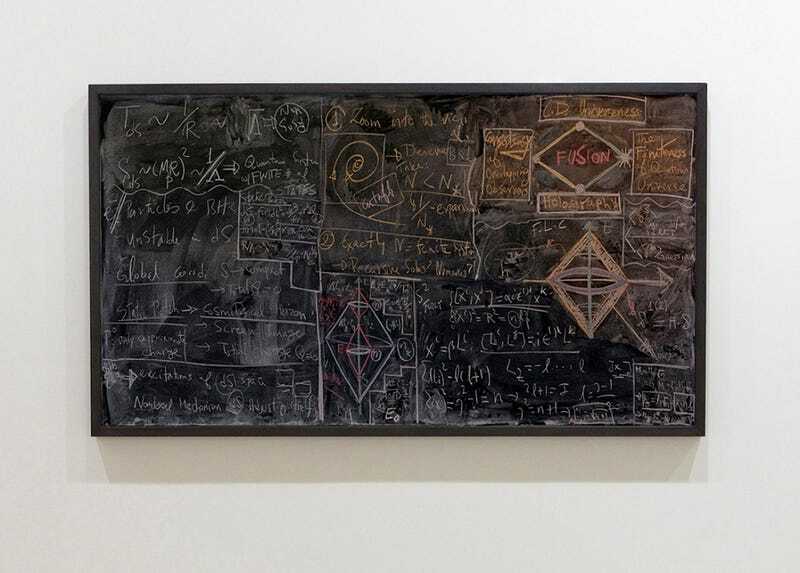 What Do You See In This Quantum Mechanics Class' Chalkboard? According to artist Alejandro Guijarro and his Momentum project, what you end up doing is just seeing a graphic of line and color. But some people are definitely going to use what knowledge they have to try to figure out the subject of the lecture that day. He begins by recording the blackboard with the minimum of interference. No detail of the lecture hall is included, the blackboard frame is removed and we are left with a surface charged with abstract equations. At this stage they are documents. However, once removed from their institutional beginnings the meaning evolves. The viewer begins to appreciate the equations for their line and form. Colour comes into play and the waves created by the blackboard eraser suggest a vast landscape or galactic setting. The formulas appear to illustrate the worlds of Quantum Mechanics. What began as a precise lecture, a description of the physicist's thought process, is transformed into a canvas open to any number of possibilities. So, is that what you see in the photos below? Or are you trying to make sense of it all? Alejandro Guijarro's website, via This Is Colossal.